These are quick notes: spellings of names and authors were not fact-checked and please excuse typos. 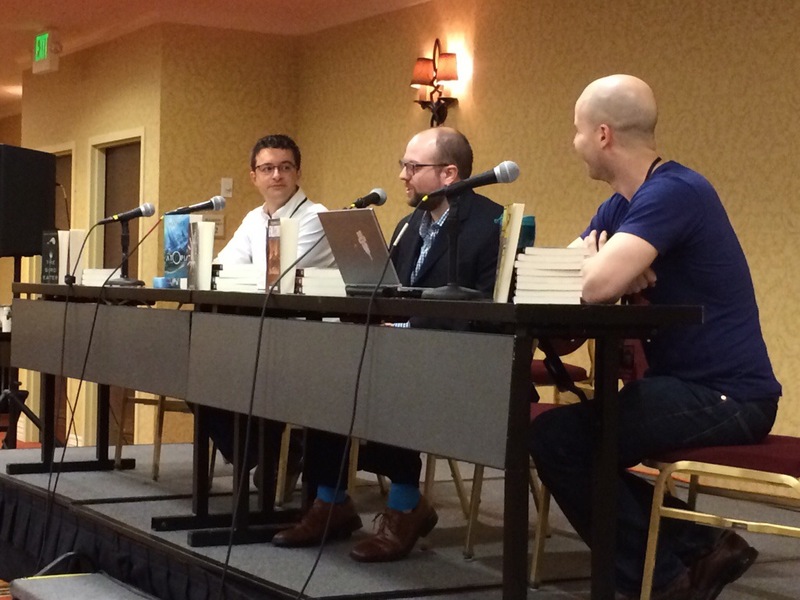 From the 47 North Panel, in which questions were posed to the two editors David Pomerico, and Jason Kirk. “My tastes run to the weird,” said Kirk. The Zombie Bible series, 5th book (I Will Hold My Death Close) in the series is coming out in July — Judea-Christian culture with zombies. A Calculated Life by Anne Charnock. A Private Little War by Jason Sheehan– “A secret jewel on our list,” Military Sci-fi, WWI planes on a distant planet. As the book goes on, “It just gets… Less and less uplifting,” said Pomerico. What got you into Fantasy/Sci-fi? Kirk:1937 book called Starmaker– it was on a Science Fiction as literature class and professor pitched it as, “It’s long, dense and you will love it or hate it.” One character, really no plot. Interrupt by Jeff Carlson– Michael Crichton style, sunspots altering evolutionary tract of humans very rapidly.